Beautifully engraved certificate from the Ferrocarriles Nacionales de Mexico (National Railways of Mexico) issued in 1909. 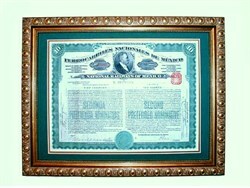 This historic document was printed by the American Bank Note Company and has an ornate border around it with a vignette of Porfirio Díaz. This item is hand signed by the Company's Vice-President and Assistant Secretary. This certificate is professionally framed in our classic, wood frame which is 1 1/4" wide with an overall size of 14 1/4" x 18 1/4". Archival mounting, acid free backing and clear glass are used in framing this certificate.The total price includes the classic gold frame and heavy duty packaging and USPS priority, insured mailing in the continental U.S.. Mailing to Alaska, Hawaii and international destinations is available at actual cost. The National Railways of Mexico was a corporation, the legal title being "Ferrocarriles Nacionales de Mexico," formed under a special Act of the Congress of Mexico in April, 1908. The purpose of the company was to carry out a readjustment plan for a combined ownership, under the control of the Mexican government, of the Mexican Central Railway Co., Limited, 3,528 miles; the National Railroad Co., of Mexico, 1,732 miles; the Interoceanic Railway Co.. of Mexico, 736 miles; the Mexican International Railroad Co., 918 miles and the Hidalgo & Northeastern Railway Co., 152 miles, a total of 7,066 miles. The plan was declared operative in 1908. The Mexican government acquired a majority of the entire capital stock. Díaz, Porfirio 1830–1915, Mexican statesman, gained prominence by supporting Benito Juárez and the liberals in the War of the Reform and in the war against Emperor Maximilian and the French (1861—67). Defeated by Juárez in the presidential election of 1871, Díaz charged fraud and led a revolt against the government, which was not suppressed until after the inauguration of Sebastián Lerdo de Tejada. 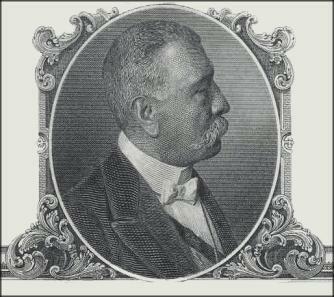 Díaz again lost in the presidential race of 1876. He refused defeat, rose against Lerdo, and gained the presidency. Aside from a brief interregnum from 1880 to 1884 when he handpicked Manuel González as his temporary successor, he remained in power until 1911.